OK, with lines like that, perhaps this writer’s rap career will remain a well kept secret. But Nielsen SoundScan’s Year-End U.S. shows that Nashville music did not play second fiddle in 2010. Below we will note the year’s Top Artists, Albums and Digital Tracks plus mention the Top country Artists of the SoundScan era (1991-1/02/2011). All the lists below are Top 10. Looking at the digital component of the above album sales, Eminem, Taylor, Ke$ha and Lady A were the Top 4 in that order. Taylor Swift gently moved Em down a notch for the overall Top Selling Artist stats. Swift’s 4.47 million units placed her ahead of Eminem’s 4.317 million. Lady A followed in third place with combined sales of 3.848 million. 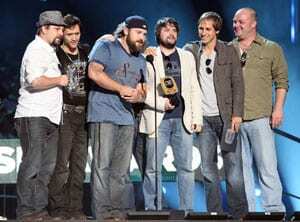 And congrats to Zac Brown Band who shifted 1.824 million units for a No. 9 position on the Top 10. Looking at Nashville’s contribution to the Top Ten selling artists of the SoundScan era we find Garth Brooks in the No. 1 spot with 68.513 million units, George Strait at No. 6 (42.396 million), Tim McGraw (No. 8; 39.396 million) and Alan Jackson (No. 9; 38.275). With album sales declining, the members of this club are unlikely to greatly change. For example, Eminem, currently at No. 7 on this exalted list (39.643 million total) sold 3.4 million units this year. At that rate it would take almost 9 years to catch Garth Brooks—assuming Mr. Brooks’ total doesn’t grow. As discussed in 2010 Sales Wrap: Country Slide, there is a digital gap between country consumers and the average of all music consumers, with respect to buying digital albums. This “divide” also applies to tracks, and as a result only one lone country song shows up on the year’s Top Ten Digital Songs list. Congrats to Lady A and “Need You Now” which downloaded a total 3.182 million units to gain the No. 10 spot and be named Top Digital Country Song. Katy Perry’s “California Gurls” featuring Snoop Dog topped the list with 4.398 million units. Looking at the Top Selling Digital Songs for the entire SoundScan era (7/04/2004-1/02/2011) Ke$ha’s “Tik Tok” rides No. 6 with 5.483 million downloads and Taylor Swift’s “Love Story” is No. 10 with 4.853 million. Tracking and charting annual unit counts, while important to navigating our industry, is not the entire story. Profits are much harder to document. Over the past few years we have seen CD list prices and sale prices drop while marketing and other costs increased. This adversely effects margins and profits. However, offsetting the bad news, track prices have gone up at iTunes and as the percentage of digital albums grows, there should be cost savings realized since there is no physical product involved. —Finishes the year as the biggest selling group of 2010 with more than 3.8 million album sales. —Need You Now album finishes the year as the top selling physical album with 2.7 million sales. —Song “Need You Now” is the most played song of the year with 600,000 spins over the airways. —For the second time in three years is the biggest selling artist for 2010 with more than 4.4 million album sales. —If it wasn’t for the passing of Michael Jackson in 2009, Swift would have been the best selling artist for three consecutive years; she came in second behind Michael in 2009 with 4.6 million album sales and was the best selling artist in 2008. —Has sold more than 4 million album sales for three consecutive years; the only artist to sell 4+ million albums each of the last three years. —Speak Now in the best selling Internet album in 2010 with 185,000 sales. —Ends the year as the most played artist over the airways in 2010 with more than 1.1 million spins; edging out Lady Antebellum, by 1,000 spins.